Many of the sea creatures in Allie’s Return are different than those I mentioned in Oceania, so I’m going to highlight them in this blog post. Just like the blog posts about sea creatures for Oceania, I’ll be splitting these up into marine life off the continental shelf and marine life in the deep sea. To begin this two-part series, I’ll be focusing on the animals one could see most often in the photic zone. Some of the animals in Allie’s Return are ones I’ve already written about, so if you want to read about those animals again, you can access the first sea creatures blog post here. The sea otter (Enhydra lutris) is comprised of three subspecies in the Pacific Ocean. Off the coast of the United States, there are two different subspecies of sea otters. One is the northern sea otter (Enhydra lutris kenyoni) and the other is the southern sea otter (Enhydra lutris nereis). The ones Allie and Samantha saw in the novel would have been Enhydra lutris kenyoni based on their location. Sea otters are dark brown in coloration, with the ones in Alaska having slightly lighter fur on their heads(1). They weigh from 16 - 45kg (35 - 100 lbs)(2) and can live from 10-15 years for the males and 15-20 years for the females (1). The oldest known lifespan of a sea otter was 23 years(4). They range from 140 -148 cm (55-58in) long(3). Sea otters are a keystone species, which means that their role in the environment is essential to maintaining the health of the ecosystem. Sea otters keep sea urchin numbers at a sustainable level so they don’t eat the entire kelp forest, which could cause the collapse of the kelp forest ecosystem. Other staples of their diet include mussels, clams, abalone, crabs, and snails. Each day, they eat up to 25% of their own body weight(1). Sea otters are social animals. In Alaska, they can be seen in aggregations of up to 2,000 individuals. They aggregate in either all male groups or female and pup groups. After a gestation of 6-8 months, females give birth to one baby called a pup. Rarely they have two pups, but only one is likely to survive. Often, sea otters can be seen grooming their coats. They have natural oils in their fur to help resist water. For the fur to stay insulated and waterproof, the hairs need to be clean and air must be trapped underneath. The trapped air underneath the fur of sea otters allows the heat from its body to provide extra insulation. The air is what gives the sea otters a silvery appearance when underwater(3). An interesting fact about sea otters is that they have the thickest fur of any mammal! They have 850,000 to 1,000,000 hairs per square inch (100,000 hairs per cm) (2). All subspecies of sea otter are listed as endangered. They were hunted for their fur for decades until they were protected. Their populations are still recovering(5). If you would like to see more pictures of sea otters, click here to go to Arkive.org. Salmon sharks (Lamna ditropis) are a migratory shark species that range from the Northern Pacific Ocean in the Bering Sea to Baja California. They swim in offshore waters including down to depths of 152.4m (500ft) (6), but they prefer waters with a temperature range from 2.5 to 24°C (36.5 – 75.2°F)(9). They exhibit countershading, with a dusky gray coloration on top and white with splotches of gray on the ventral side. Typically, they are between 2 – 2.4m (6.5 – 8ft) long, but the largest recorded ones have reached lengths of over 3 (10ft). Weighing in at over 300kg (660 lbs), they live for about 25 years(6). The salmon shark gestation period is 9 months and they give birth to live young that are entirely independent upon birth(6). Their litters are about two to five pups which use oophagy (eating of unfertilized embryos) to obtain nutrition in the womb(9). During their migration, they stick to one side of the Pacific Ocean. This shark species exhibits sexual segregation. Males tend to inhabit waters off the Japanese coast in the western Pacific, while females live off the North American coast in the eastern Pacific(7). Males migrate along the coast of Asia and females migrate along the coast of North America. Both migrate based on the availability of their prey. They eat several species of salmon such as Coho, Pink, and Sockeye salmon. They also eat birds, herring and other fish, sea otters, and squid(6). Some interesting facts about them are that they can swim as fast as 50 mph, use their liver for buoyancy instead of a swim bladder, and have a double keel on their caudal fin, which is uncommon for sharks. They can also thermoregulate their body temperatures between 14-20°F degrees above the temperature of the water(6). Although salmon sharks are victims of shark finning and other parts of their body are consumed by humans, the IUCN lists them as least concern. Research on them is limited, but their populations are thought to be stable (8). 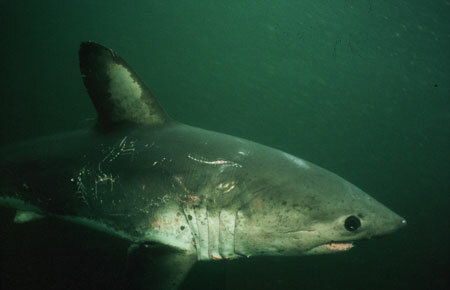 To see a better photo of a salmon shark, click here. Orcas (Orcinus orca) commonly known as killer whales are not actually whales, but dolphins. Orcas are found in oceans worldwide and in the Gulf of Mexico, the Red Sea, Arabian Gulf, and the Mediterranean Sea. They have even been recorded in estuaries, rivers, and bays. Black everywhere except for their ventral side where they are mostly white, they have a large white eyespot commonly mistaken for their eyes on the lateral sides of their bodies. The males are larger than the females and can have dorsal fins as high as1.8m (6ft). Individuals can be identified by the shape of their dorsal fin or the gray spot behind the dorsal fin called a saddle patch. Males weigh up to 9,000kg (19,842lbs), while females are a lot lighter at 5,500 kg (12,125.4lbs). An orca’s gestation period is from 15 - 18 months with calves being 180kg (397lbs) when born. They live to be 90 years old, but the females stop reproducing at age 40(10). Orcas are split into three different forms—residents, transients, and offshore. The three different forms have different feeding ecology and areas where they roam. 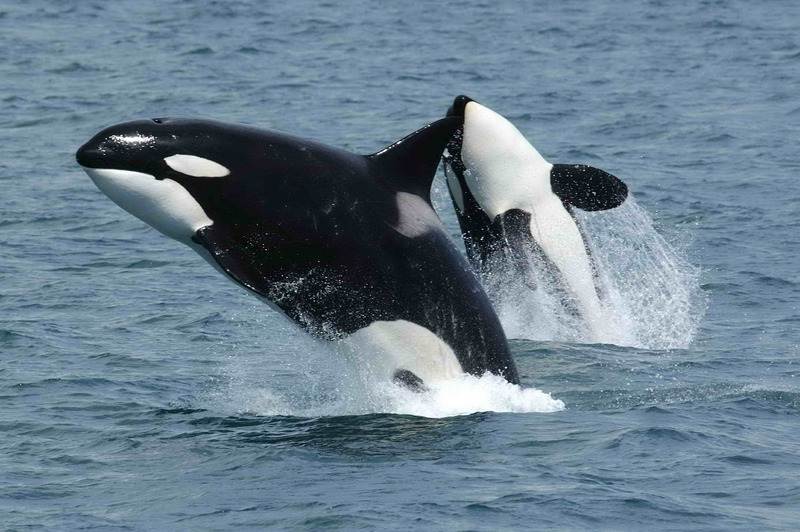 Resident orcas stay in a territory while transient orcas roam the sea. The three forms differ in diet, level of socialization, the way they communicate, and even genetics. Resident orcas in the northern Pacific Ocean have a diet dominated by salmon, whereas transient orcas’ diets are comprised of marine mammals and seabirds. Offshore orcas have been known to eat sharks. In general, though, the orca diet consists of squid, octopuses, sea turtles, seabirds, sharks, fish, other cetaceans and even whales. They use a variety of hunting techniques that are passed down from generation to generation. These strategies include herding fish, ambushing prey by rushing onto a beach, or creating waves to knock seals off ice floes(10). Orcas are very social animals. They use clicks, whistles, and screams to communicate with one another. Breaching, tail slapping, and spyhopping can be another way they communicate with one another. One pod can have 40 – 50 individuals, but larger groups can exist when several pods join together. They live in matrilineal groups (meaning relation based on the mother) with the oldest female leading the group. Orcas that share blood and use unique calls between one another are called pods, while clans include pods with similar dialects. Communities consist of a variety of pods that may or may not be distally related. More research is being conducted on their social structures(10). As for conservation, according to the IUCN Red List, they are considered Data Deficient. It means that not enough research has been conducted on their populations to make a determination on which risk level they are(11). Humpback whales (Megaptera novaeangliae) are uniquely well-known for their songs, which scientists still are unsure of their purpose. Males are the only ones known to sing and their songs can be heard from 30km (20mi) away(12). Humpback whales can grow to be 18m (60ft) long and weigh 40 tons. Their pectoral fins can be 5m (16ft) long, which is around a third of their body length and the longest of limb of any animal on Earth(13). Their dorsal portion is black, while the ventral side is white with mottled black. The “knobs” or “bumps” you see on a humpback are actually called tubercles. Like orcas, they can be identified by their dorsal fins, which are unique to each individual. The gestation period for a humpback whale is 12 months and calves are 3-4.5m (10-15ft) long and weigh 907 kg (2,000lbs) when they are born(13). In their first year, humpback whale calves double in size(12). Calves take ten years to reach adulthood but will live to be 50 years old(13). They are very close to their mothers and often stay close enough to touch them while swimming (12). Known for their long migrations, humpback whales migrate from the poles during the summer to the equator during the winter (12). They have the longest migration of any animal on Earth. Typically, they travel 5,000 km (3,109 mi), but the longest recorded trip was 18,839km (11,706mi) from American Samoa to Antarctica. However, they can be found worldwide, and the only population that doesn’t migrate are the ones that live in the Arabian Sea(13). Like all baleen whales, humpback whales don’t have teeth, but instead, use baleen plates to filter food out of the water. They eat krill, plankton, and small fish. One of the ways they capture food is by using bubble netting. When hunting together, humpback whales will work together to blow bubbles around fish to corral them in and then take turns gulping up the fish. They can eat 1,360kg (3,000lbs) of food per day! As for conservation, humpback whales are listed as least concern(14). To see a photo of a humpback breaching, click here. Sperm whales (Physeter macrocephalus) are the largest of the toothed whales. Males are 18m (60ft) long, while females are almost two-thirds of the size at 11.2m (37ft) (15). From 32-41MT (35 – 45T) in adulthood, the sperm whale also has the largest brain of any animal on Earth (16). They have a dark gray coloration and wrinkled skin to help reduce heat loss. Their heads take up a third of their entire length. Sperm whales have a hump instead of a dorsal fin on their backs with a few sets of bumps following the ridge of the hump(17). Unlike other odontocetes, sperm whales have blowholes on the left side of their heads. They can close them when they dive to hold their breath. Amongst marine mammals, they are the deepest diving. Diving up to 1,000m (3,280ft) is nothing for them, and they can hold their breath for up to two hours(15). The purpose of the large organ that fills most of their head—the spermaceti organ—is thought to be a buoyancy regulation organ. The organ is filled with a liquid that can be cooled or heated. It is thought that by increasing the density of the oil, it helps the whale to sink or by decreasing the density to rise to the surface (17). After using echolocation to find their prey, they use a strategy of sound wave blasts to stun their prey (16). Squid are their food of preference (15), but they’ll also eat fish and octopus (17). Each day they eat around 907kg (2,000lbs) of food(16). They inhabit all oceans, but not in the very far north or south poles. They are social animals and can be seen in pods of up to 50 individuals. They have distinct clicks called codas that be used to identify each other. The females prefer more tropical waters, while the males spend their time in temperate waters. The males tend to form herds with other males called bachelor groups, while females stay with other females and calves called nursery groups. The gestation period is 14-16 months and calves are 4m (14ft) long and 2,000 pounds (907kg) when they are born (15). The IUCN Red list Lists sperm whales as vulnerable (18). Whaling in the 18th and 19th centuries brought their numbers down and today they are still recovering. The whalers took the oil they found in their spermaceti organ and also ambergris from the whale’s gut which was used in perfume(15). To see a close up of a sperm whale, click here.